Medical Center Health System (MCHS) has proudly served Odessa and the surrounding 17 counties of the Permian Basin for over 60 years. 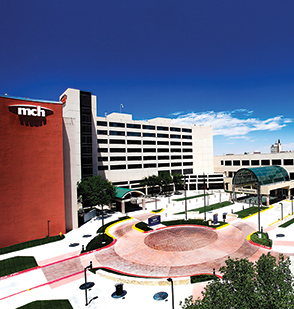 Anchored by Medical Center Hospital, MCHS is the only comprehensive health network in the region. Medical Center Hospital: Their 402-bed flagship hospital offers a full spectrum of medical, surgical and advanced outpatient services. MCH Center for Women & Infants: Odessa’s newest and most advanced maternity hospital features all private rooms, private Neonatal Intensive Care Unit and the region’s only Ronald McDonald Family Room. MCH Center for Health & Wellness: Offers a broad range of services including preventive medicine, diabetes management, advanced imaging, rehabilitation, laboratory, fitness, sports medicine and urgent care. MCH Family Health Clinic: Proudly serves our community with a broad range of affordable medical services including women’s health, dental and family medicine. MCH ProCare: Their affiliate organization manages a consortium of general practitioners, independent and group specialists, mid-level providers and walk-in clinics. MCHS has received top-quality ratings ranging from Phase III Chest Pain Center Accreditation with PCI by the Society of Chest Pain Centers – to Stroke Program certification from The Joint Commission and recognition as a Breast Imaging Center of Excellence from the American College of Radiology, among many others. You can see a complete list of their facilities and services on their website at www.mchodessa.com. For more information, call (432) 640-6000.